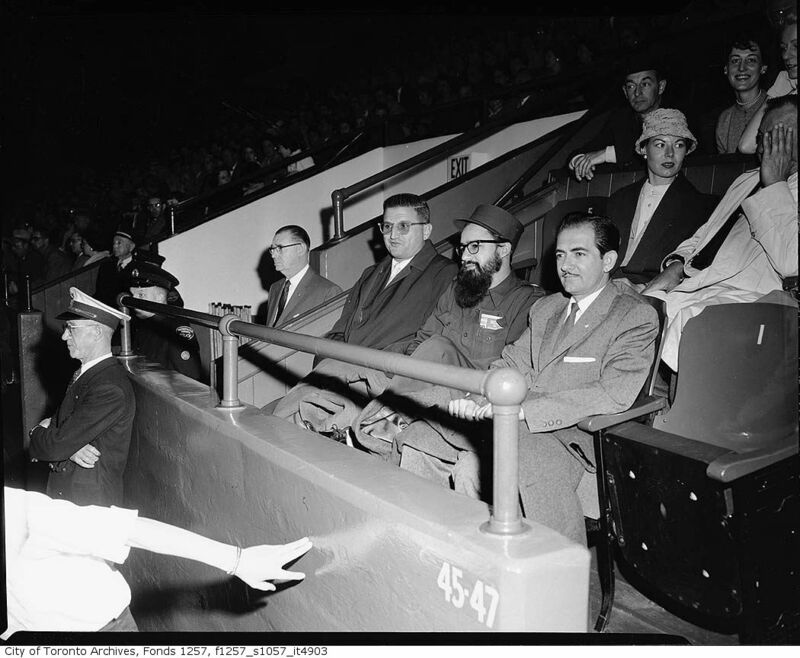 So, no, that wasn’t Fidel Castro attending his first post-revolutionary hockey game at Maple Leaf Gardens. As I wrote in this space back in 2012, it couldn’t have been, based on Castro’s having bypassed Toronto on his 1959 visit to Canada. But I wasn’t able, at the time, to identify the Castro-looking fan in the good seats at MLG. Staff at the City of Toronto Archives cleared the case for me this weekend, as news carried from Havana that Castro had died at the age of 90. Touring Toronto in April of 1959 (above, in uniform) was the Cuban revolutionary government’s own Director General of Sports, Captain Felipe Guerra Matos. He was a former rice-mill manager turned rebel, 32, wounded three times as a comrade of Castro’s in the long fight to oust the government of President Fulgencio Batista that had only come to its end in January of the year. Like Castro, Matos had started his North American journey in the United States, dropping in to New York to see Mickey Mantle’s Yankees beat the Boston Red Sox 3-2 in their American League home opener April 12. Travelling on to Toronto, Captain Guerra was pencilled in as the starting (ceremonial) pitcher as the local (not-hockey) Maple Leafs opened their International League season against the Havana Sugar Kings. Ontario Lieutenant-Governor J. Keiller Mackay ended up tossing the opening pitch, from what I can tell, with Matos as his catcher: the Toronto Daily Star judged it weak. Leafs won, 6-5, in front of 14, 268 fans. Honest Ed Mirvish was on hand to present Captain Guerra with a gift the Leafs wanted the Cuban people to have: a tractor. It was later the same evening that Captain Guerra dropped by Maple Leaf Gardens, along with (to Guerra’s right) Bobby Maduro, who owned the Sugar Kings, and (to his left) the team’s road secretary, Ramiro Martinez. Hockey’s Leafs had finished their season a week-and-a-half earlier, losing in the Stanley Cup final to Montreal. But the Cubans were just in time to catch the Whitby Dunlops take the Allan Cup from the Vernon, B.C. Canadians, and that’s who they’re watching here. 8-3 was the score, which meant that the Dunnies won the series four games to one. Doesn’t sound like it was great finale: “a dreary conclusion,” the Star’s Jim Proudfoot adjudged. Over and above Cubans, only 1,952 spectators showed up to watch Whitby captain Harry Sinden raise Canada’s senior amateur trophy. No word on just whether Captain Guerra took possession of any further farm machinery. I don’t think so. He did sit down during his time in Toronto with Star columnist Lotta Dempsey, with whom he chatted about his wife and sons; youth fitness; and whether the revolutionary executions of five or six hundred Batista murderers and torturers really mattered in light of the indifference with which the world had regarded the unspeakable cruelties of the former regime. 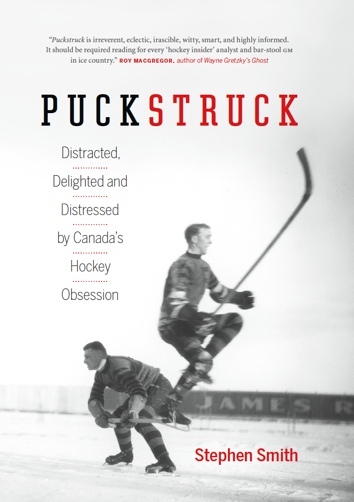 Back at Maple Leaf Gardens, The Globe and Mail’s Ken McKee wondered, having spent most of the previous three years in Cuba’s Oriente mountains with Castro, what did Captain Guerra think about hockey? In fact, his office was very interested in bringing hockey to the people of Cuba, most of whom had never seen it before. Harold Ballard was in the house, president of Toronto’s junior Marlboros and a member of the Maple Leafs’ management committee. He said there might be interest in taking a couple of junior teams down, so long as there was money in it.